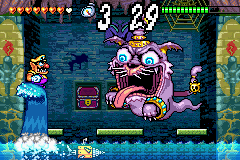 The Mechanical Fish is an enemy in the Game Boy Advance game Wario Land 4. It looks like a yellow submarine in the shape of a fish, with a drill for a nose, a periscope, red eyes, and grey fins. The Mechanical Fish only appear in the boss battle against Catbat in the Sapphire Passage. They are found one at a time, swimming in the water channel in the boss room, swimming back and forth with the intention of harming Wario with its drill. The Mechanical Fish can only be defeated with an S-Ground pound. ↑ The Wario Land 4 official Shogakukan Japanese game guide does not give this enemy a proper name, instead referring to it on page 134 using the phrase: 「機械の魚のような敵」 kikai no sakana no yō na teki, meaning "[the] enemy that is like a mechanical fish". The conjectural title is taken from the "mechanical fish" part, 「機械の魚」 (kikai no sakana). This page was last edited on April 23, 2019, at 08:20.